Light sensors have all sorts of practical uses in the modern era, most notably in devices with auto-brightness for their screens and in digital cameras to adjust exposure. With the Ambient Light Sensor Breakout, it's be a breeze to interface with the TEMT6000 Light Sensor so you can bring the ability to detect light levels to any project. As the name suggests, the TEMT6000 Light Sensor will detect the brightness of its surroundings. While there are many properties of light that can help us categorize its brightness, the TEMT6000 measures illuminance (measured in lux (lx), often denoted Ev). Don't worry if illuminance is new to you though, the TEMT6000 is very intuitive to use: brighter = more current, darker = less current. In this guide, we’ll show you how to quickly get the ambient light sensor breakout up and running, then discuss some of the more technical details of how it functions. After that, we’ll show you how to use it to make a practical DIY nightlight! Check out our Light Tutorial for more information on the technical properties of light. An intuitive understanding of light should be enough to make use of the TEMT6000, but, if you're looking for more precise applications, this is worth the read. This sensor is a phototransistor. Knowing how transistors work will be helpful in using the TEMT6000. 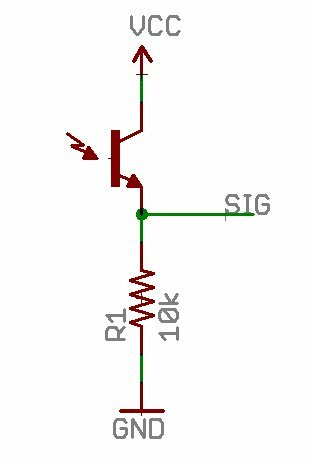 A voltage divider circuit is used to create a usable signal from the light sensor for a microcontroller. A basic understanding of voltage dividers is recommended. To read the voltage coming from the voltage diverer circuit, an Analog to Digital Converter (ADC) will be necessary. This tutorial will show how to read the voltage on the ADC found on an Arduino microcontroller. We recommend soldering some male header-pins to your TEMT6000 breakout to make it easier to use, so be sure to read our Soldering Tutorial for details on good soldering practice. Knowing more about the TEMT6000 itself couldn't hurt, so here's a link to its datasheet. As you can see from the image below, the TEMT6000 is about as simple as it gets when it comes to breakout boards. The three pins broken out are labeled on the top of the board. The function of each pin can be found in the table below. Being a phototransistor, this sensor acts just like any other NPN transistor -- the greater the incoming light on the Base, the the more current that can flow from the Collector to the Emitter. Only light that falls within the visible spectrum (390–700 nm) will alter the Base. Infrared, ultraviolet, or any other light we can’t directly see will have no effect on the sensor. 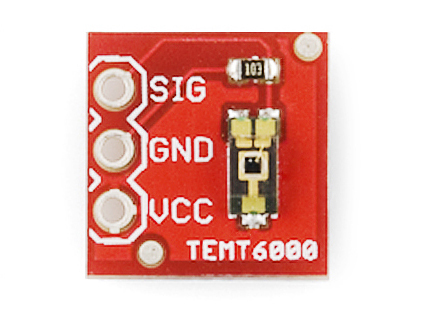 This sensor can handle voltages from both 5V and 3.3V devices. To make taking light measurements as easy as possible, this sensor has been designed into a voltage divider circuit. The TEMT600 acts as one of the resistors in the divider, and, as the light hitting it changes, so too does the voltage on the SIG pin. To read that voltage, simply connect the SIG pin on the TEMT6000 to any analog to digital conversion pin on your microcontroller. The voltage value returned from the SIG pin will vary depending on what voltage is being used to power the sensor and depending on the resolution of your ADC. First, let's fire up our light sensor and start collecting readings from it. The rest is just plugging parts into the RedBoard. Start by taking any basic LED of your preferred color and placing its anode leg (the long leg) into a pin whose label is followed by a ~. 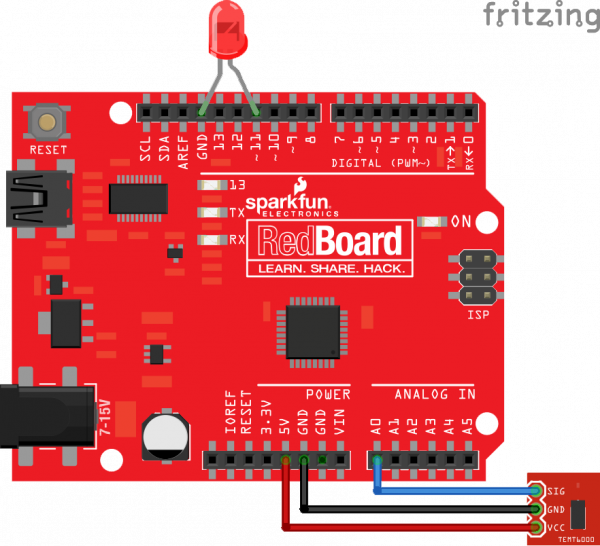 This mark on the RedBoard means the pin supports pulse-width modulation (PWM), which is just a technical way of saying we can control the voltage output of the pin digitally; in this case it lets us control the apparent brightness of our LED. We want this because our LED is going to show us the relative brightness of the world through the eyes of our TEMT6000. If you're using a different board, be sure to read its documentation closely to see which of its pins support PWM. Place the other leg into ground (GND). 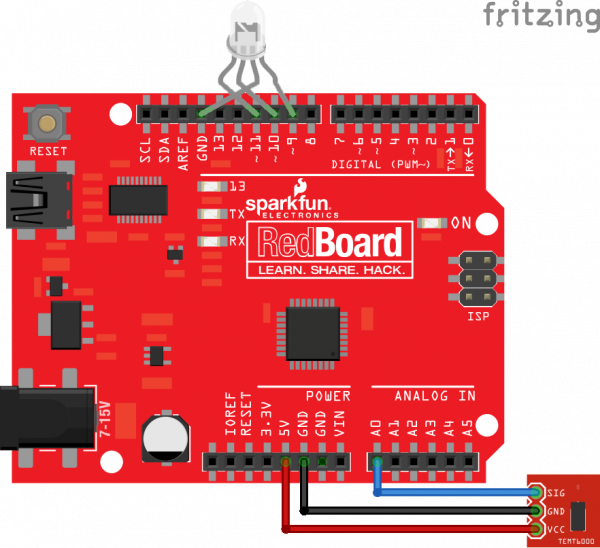 We used pin 11 on the RedBoard because it is the PWM pin closest to a ground pin. Thus, we didn't have to deform our LED's legs too much. This is the pin we'll be using in the sample code, so be sure to modify that constant if you're using a different physical pin. Next comes the light sensor breakout. Start by connecting the female ends of some male-to-female jumper cables to the pins we soldered to it earlier. Connect VCC on the sensor to the 5V pin on the RedBoard, GND to GND, and SIG to any analog pin (we'll be using A0 in the sample code). Use the table below to aid in wiring. Now we're finished with the hookup, it's time to upload some. Try oscillating the TEMT6000 towards the RedBoard's green "ON" LED to see the change. Diagram depicting the nuances between the various measurements of light. Why does the TEMT6000 measure illuminance? In most practices, measuring the intensity of light without factoring in distance is very difficult, and puzzled early astronomers for a long time. In short, there is apparent magnitude (how bright a source appears) and absolute magnitude (how bright the source actually is). Two sources of different absolute magnitudes can have the same apparent magnitude depending on their distance from the observer. For example, if you have a bright source far away and a dim source very close, they can appear to have the same brightness because the brighter source's light will have to dissipate over a larger volume. 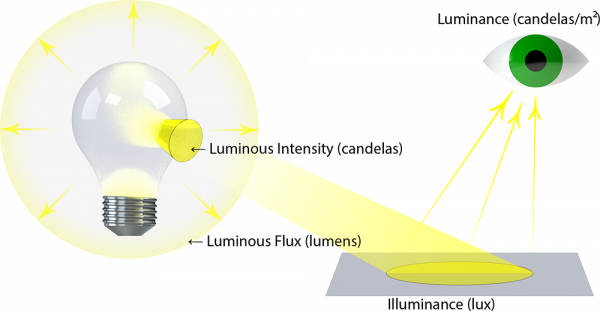 This is why the sensor will read a smaller value if you move the same source of light farther away from it, essentially increasing the amount of space that the same amount of light has to fill between the source and the sensor (i.e. reducing the illuminance, as you're dividing by a larger surface area of the light-sphere generated by the source). Found in the TEMT6000 datasheet. The TEMT6000 only recognizes light with wavelengths in the range of 390–700 nm, which roughly covers the entire spectrum of visible light. In other words, this won't pick up infrared, ultraviolet, or any other light we can't directly see. Now that we understand the TEMT6000 a little better, let's use it in something more interesting and build ourselves a night light that turns itself on and off! Since we're reusing a lot of the same parts, they're mostly going to occupy the same pins on the RedBoard: VCC on the breakout should connect to 5V on the RedBoard, GND to GND, and SIG to A0. The main difference is now we have an RGB LED that has twice as many legs, but the idea is still the same. 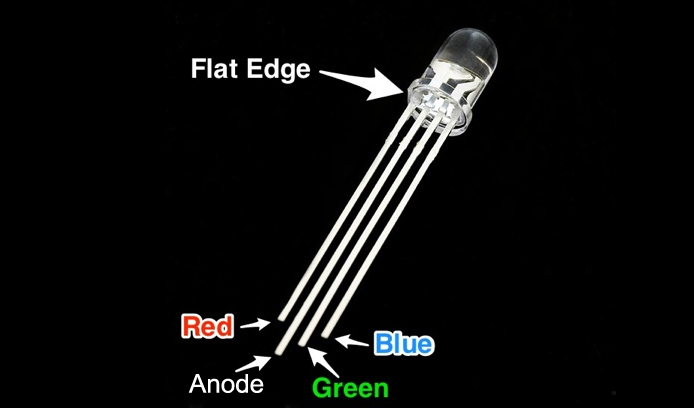 The longest leg on a common anode RGB LED is going to be the pin that goes to the GND pin. Most Arduino boards have a group of three consecutive PWM pins, and these happen to be pretty close to a GND. If the legs on your LED aren't bent too bad, you should be able to see which is the second longest leg—that's the cathode for the red LED, and that should go to pin 9. Plug the remaining two legs into pins 10 and 11 in the orientation they appear to go in easiest. Use the image below, if you can't tell the difference between the legs. This table should clarify, which pins are connected. The code for this one is going to look a little different. The challenge is that we want to cycle through all the colors without being stuck in a loop and unable to read light values until the loop is done. The way around this is to use a function that will take a variable that counts and returns a color based on how far that variable has counted. This way, for every "count" (cycle of the loop) we have time to stop and check our TEMT6000 for a reading. There are some other little tricks that are explained in the comments. The drill for uploading the code is the same as before. #define POWER  4   /* Power to raise the ratio of read-value to largest read-value. #define TIME  500 /* The amount of milliseconds before taking a step through the color function. uint16_t  _max =  0;  //Holds the largest brightness reading so far. float     ratio = 0;  //Stores the ratio of current brightness to largest recorded brightness. /* Each color has the same pattern of increasing and decreasing brightness, just not synchronously. * amount of milliseconds since the arduino has been on) is evenly divisble by TIME (i.e. Want a wearable version of the TEMT6000? You're in luck. Build a light-detecting garment, with the LilyPad Light Sensor. 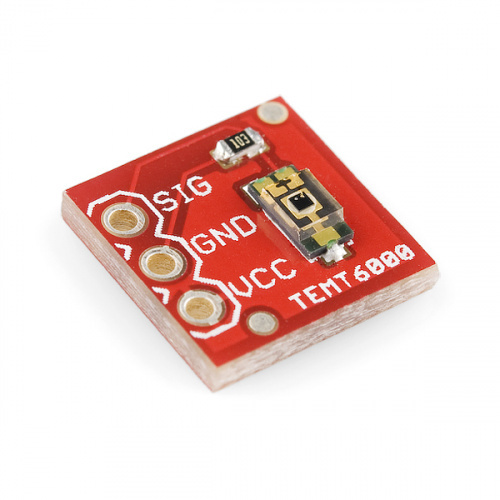 The TSL2561 Luminosity Sensor Breakout is an integrated sensor that can detect both visible light and infrared light. The ISL29125 RGB Light Sensor can detect light that is specifically red, green, blue, or any combination thereof. The ML8511 UV Sensor Breakout works similarly to the TEMT6000, but responds to ultraviolet light instead of visible light. The Mini Photocell is a very small alternative to the TEMT6000, however it is a photo resistor (a resistor that changes resistance based on the presence of light) instead of a phototransistor. If you plan on using the nightlight indefinitely, an energy-conscious suggestion would be to integrate a Wake on Shake. The Arduino will constantly be running and checking if its dark, which can use up a lot of energy over time. A Wake on Shake would make the current draw negligible until you bumped the circuit. This way you can easily activate the light in the dark if you need it, and would practically be off otherwise. Want a night light for outdoors? The Sunny Buddy makes keeping a battery charged with solar energy easy. Your night light could store energy during the day, and light the way for you at night! Of course you may want to also invest in a transparent plastic case to keep the elements out.